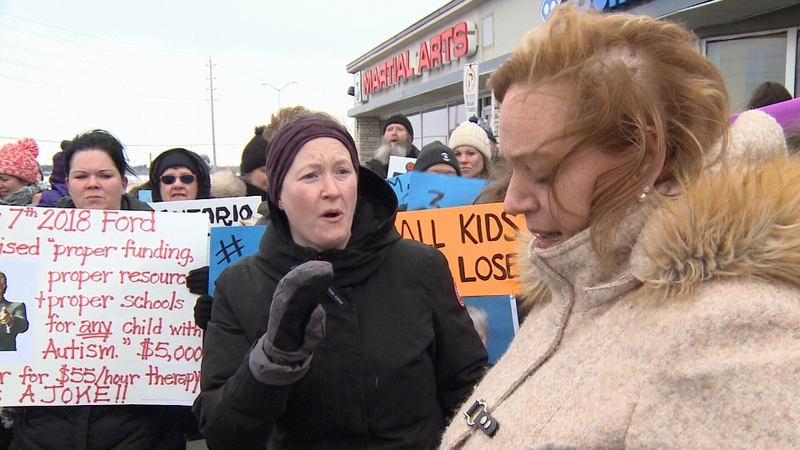 Ontario's Minister of Children, Community and Social Services confronted an angry crowd outside her constituency office in Ottawa today. They were protesting changes to autism funding. An emotional Lisa MacLeod told parents that the new policy is the right one and she's not backing down. No one had expected Lisa MacLeod to come out of her office and talk to the crowd. She expected and got an earful but stood firm in her conviction that this was the only way to help all the kids on the autism spectrum. They came to Lisa MacLeod's constituency office, with placards in hand and kids by their side. “I’ve lost my job because he’s not getting proper supports at school so I’ve had to stay home with him,” added Taylor Davies, whose son Grayson is living with autism. She says under the new funding policy, the situation is about to get drastically worse. The parents came ready to fight the Ford government's overhaul of the autism program, changes that prompted a PC political staffer to quit on Wednesday. Bruce McIntosh had resigned Wednesday as the legislative assistant for MPP Amy Fee. McIntosh, who is also the former head of the Ontario Autism Coalition, is the father of a child with autism. Enter into that emotional fray, the Minister, Lisa MacLeod who made the announcement on the funding changes, aimed at clearing the list of 23,000 children waiting for therapy. But parents argue those changes will take money away from those who need it most. Under the new program, families will receive funding directly up to $140,000, depending on age, for a child in treatment from ages two to 18. Families will receive up to $20,000 a year until their child turns six and that drops to $5,000 a year until they turn 18. Kerry Monaghan was one of the families invited to meet with the Minister. Monaghan is the mother of 2 children on the autism spectrum. While her son Jack was approved for therapy under the current program, her daughter Charlotte is nearly 900 on the waiting list, at a cost of $4000 a month for therapy. Monaghan worries both her children will be severely impacted by the Ford’s policy changes. While talks began with a couple of those families, back outside Dana Williams wondered how this will all end for her two young children. One of the mother's asked Lisa MacLeod as she walked into her office what she would do if it were her child caught in this mess. She told her she'd do exactly the same thing and fight like hell.